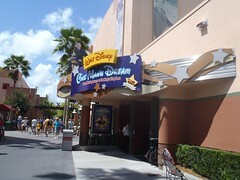 Walt Disney's One Man's Dream is an exhibit and movie. You can wander through the exhibit at your leisure and then go in and watch the movie when they announce it is about to start. However, after the movie you have to exit and have to come back around if you did not finish looking at everything before seeing the movie. It is an okay place to get out of the heat, but the exhibit area seems to get crowded easily even though the theater seemed rather empty when we then saw the movie. Mik and I both really enjoyed the displays of various things from Disney and Disney World history. However, it got rather congested in some spots with there not being much open space to maneuver around the stuff on display and people trying to skip around. 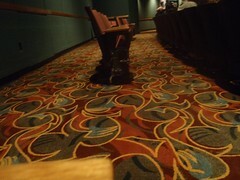 The theater was good, though, with wheelchair spot and companion seats in the back.